Stone: 8mm Cushion Cut Cubic Zirconia Center Stone Surround by Cubic Zirconia’s in Halo Setting (An 8mm CZ stone is the equivalent of 2 Carat diamond). Description:This ring is based on a comfort fit band and is Rhodium plated for longer lasting shine. Please see our cleaning and care for information on caring for Rhodium plated Jewelry. We used high quality Cubic Zirconia’s for all of the stones in this ring. 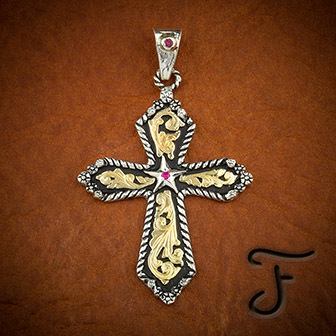 Fanning Jewelry is proud to present a large collection of beautiful sterling silver and gold-overlay western jewelry and accessories. Each individual piece is handmade by skilled craftsmen who take great pride in the products they create. The Fanning Jewelry line consists of pendants, rings, western wedding sets, and other handmade artisan jewelry pieces and accessories. We are a unique family-owned and operated company dedicated to creating quality handmade artisan jewelry and having satisfied and loyal customers. We have been in business since 2003. Customers often tell us that they wear our pieces with pride, garnering many compliments from admirers. Please feel free to browse our site and contact us with any questions you may have.